I attended the (mostly) one-woman improv show Blind Date last night, which I realized later was the first performance of the six-week run (I got my ticket months ago as part of my Ordway season package). I didn't really know what to expect and was pleasantly surprised at the fresh and funny show. I don't think I've ever seen an improvisational comedy show (which is inexcusable since we have one of the best companies here in Minneapolis). But it really is a thing of beauty to see an entirely new piece created before your eyes. 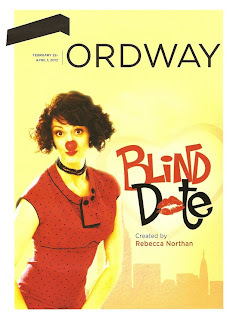 The concept is this: Mimi (played by Rebecca Northan who also created the show) is stood up on a blind date, and picks a man from the audience to be her date for the evening. The audience gets to watch the date unfold, full of all the typical moments of a first date - the awkward pauses, the uncertainty, the sweetness, someone saying the wrong thing, truths coming out, and even real moments of connection. It's great fun to watch it all play out from the safety of the audience. Mimi mingles with the crowd before the show and vets the candidates for her prospective date, speaking in a charming French accent. I imagine after doing this for several years she knows how to spot someone who will make a good "date." She spoke to me as well and complimented me on my retro sweater clip, which fits the theme of her own fabulously retro look (check out this website where she gets her wardrobe - super cute retro dresses). So get there early if you want a chance to be on stage, or avoid her if you don't. You'll know her when you see her - she's the one wearing the red clown nose. Once chosen, Mimi invites her date onstage and takes him aside to a stool in the spotlight to explain how the evening works. She gives him the option of calling time-out at any point during the play if he needs some guidance, and tells him to just be himself and not try to act or play a role. The date begins with a few glasses of wine in a cafe, and where it continues on from there depends on the date and in some cases, the audience's choice (it's like Choose-Your-Own-Adventure theater). In the unique one-of-a-kind play that I witnessed, the date continued to Mimi's car and to her apartment, and then flashed forward to five years in the future. Art student Andy was a great choice for Mimi's first blind date in St. Paul. He gamely followed wherever Mimi led him (albeit understandably reluctantly at times). She asked him some pretty personal questions, which he answered truthfully (one assumes), and also asked him to do things one doesn't normally do in front of a few hundred people. As Mimi told him at the end of the show, he did things with a smile on his face while most people sit in the dark and think, "thank God it's not me!" (I know I did; I had empathetic sweaty palms!) Rebecca as Mimi is an expert improv comedian, having worked at the famed Second City among other places. And she also does a wonderful job working with a non-professional. She knows when to fill the silence with a wacky story (grandmas on ecstasy or lazy impressionist painters), and when to let it hang there awkwardly until her date is forced to say (or do) something. Never breaking character (Mimi is visiting St. Paul from France), but occasionally sharing winks and knowing looks with the audience. Blind Date is a family affair. Rebecca's brother, Jamie Northan, is the snooty waiter at the cafe. He also provides "guy advice" and a pep talk for Mimi's date when it becomes necessary, as it did during that crucial and particularly awkward moment of the date. (And he reminds me a bit of Eddie Izzard, which is a good thing.) Rebecca's ex-husband Bruce Horak fills in other necessary roles, such as the cop that pulled Mimi over for erratic driving ("we were listening to some great music!"). You have six weeks to check out this show, and maybe get a chance to have a date with Mimi yourself! She's charming, funny, wacky, smart, quick-witted, and a great person to spend an evening with. More than that - this is the kind of theater I want to support. Artists doing something new and different and a little bit risky, creating work that's innovative and unique. To quote Mimi, it's amazing. I might go back again in a few weeks, just to see how different the show can be each night.